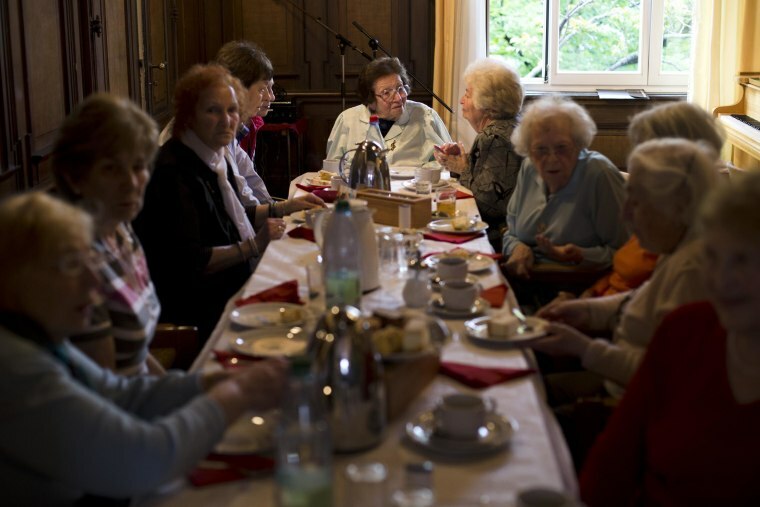 FRANKFURT, Germany - At first glance, the afternoon gathering of nearly 30 elderly people in the cozy wood-paneled room of an apartment complex could be perceived as an ordinary "coffee klatch." But, the women and men that gather here in Frankfurt over coffee and cake once a week all share one common experience: the horrors of the Holocaust. For many of the estimated 40,000 Jewish survivors still living in Germany, the dark memories prevail nearly 70 years after WWII. Special initiatives to tackle their trauma are being offered in the country’s Jewish communities. As 90-year old Ruth Thorsch from Berlin, a passionate music teacher and herself a survivor of the Shoah, steps up to the old piano, she addresses her audience with the words: "We need to bring some vibes to this dismal gathering." Nearly 12 years ago, a group of Jewish psychologists and social workers launched its "meeting point" project, which identified a need to offer Germany's aging Holocaust survivors a "drop-in center" and "safe haven for the soul." The project is tailored to the needs of the aging group of traumatized victims of the Shoah. It offers services that range from basic support such as help with the handling of bureaucratic paperwork, to psychological counseling. “Overall we care for nearly 300 survivors, aged between 80 and 98. Many of them come here to chat, or simply to remain silent,” said Noemi Staszewski, a social worker and psychotherapist, who heads a team of six specialists in Frankfurt. “All of our elderly visitors were skeptical at the beginning and it was a long process of building trust,” Staszewski added. The experts in Frankfurt say that the experience of deadly persecution and constant betrayal has severely damaged the survivor’s trust in other human beings. “As a result, there is a deeply-rooted fear of loosing self-control," Staszewski explained. The program now spans the major Jewish communities in Germany, with five other locations across the country where the umbrella organization, Jewish Welfare Organization ZWST, cares for victims of the Holocaust. While the low-budget outlets also offer weekly afternoon programs with memory training, lectures or excursions, an additional 10 sites are designed to train social workers for the special attention and counseling that is required for Jewish victims at retirement homes. “These child survivors, whose relatives were killed by the Nazis, have lost their family environment, their social firewall,” said Dr. Isidor Kaminer, a Jewish psychoanalyst and co-founder of the Frankfurt meeting point. The live-or-die selection process in Hitler’s gruesome death camps - and other vivid memories of horrific Nazi atrocities often make ordinary doctor’s visits a difficult experience. “The association for many of these people is that being ill means being sorted out. Their fear of doctors is trauma-triggered,” Kaminer explained. Dr. Kurt Gruenberg from the Sigmund-Freud-Institute in Frankfurt incorporates his weekly encounters with the victims in analytic studies. Gruenberg and his team developed a concept which they coined "scenic memory" of the Shoah. “This means that survivors communicate their memories not necessarily verbally, but that the trauma is primarily passed on unconsciously,” said Gruenberg. “Standing, for example, is an equivalent for survival,” Gruenberg explained, as he ends a conversation with a frail Holocaust survivor who preferred not to sit down during the meeting. Not all of the visitors of the program in Frankfurt have the desire to talk about their experience with other survivors or the counselors on site. On the days when 91-year old Zosia Wysocki, and her husband Roman, 98, join the weekly get-together, they prefer to sit in the same chairs at the wall near the window. They hold hands, absorb the atmosphere in the room and once in a while, exchange a few words in their native Polish language. Zosia was once a famous actress in the Polish capital. She and her husband both survived the Warsaw Ghetto where the Nazis killed more than 30,000 people in 1942. A total of 265,000 Jews were deported from Warsaw to the Nazi death camp at Treblinka that same year. “We go through life with a smile and a tear,” she added, as her husband gives her a gentle kiss on her cheek.